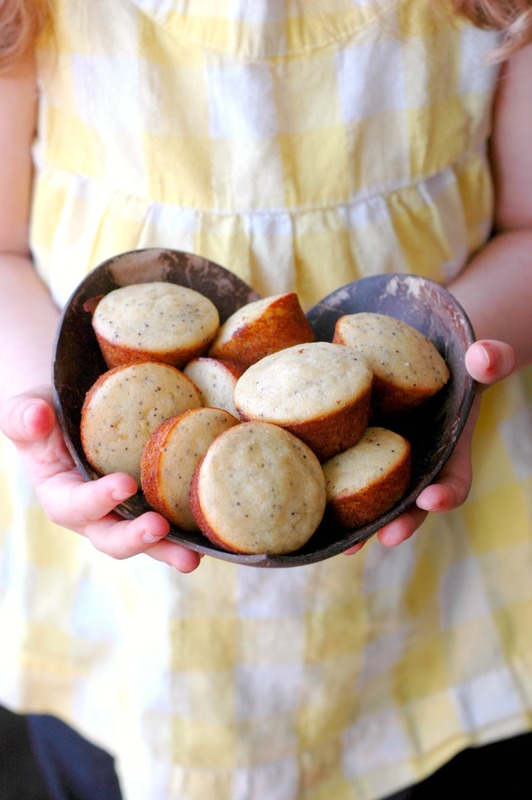 Healthy paleo lemon poppy seed muffins are your answer from everything to Easter brunch to your weekday school morning breakfast rotation! I saw my first robin of the spring last week, and while that might not seem like huge news, it pure joy after bitter cold and snow for the last 4 months! We are perfectly giddy to put the snow gear away, and have been enjoying more daylight, sunshine, and the promise of warmer air coming soon! 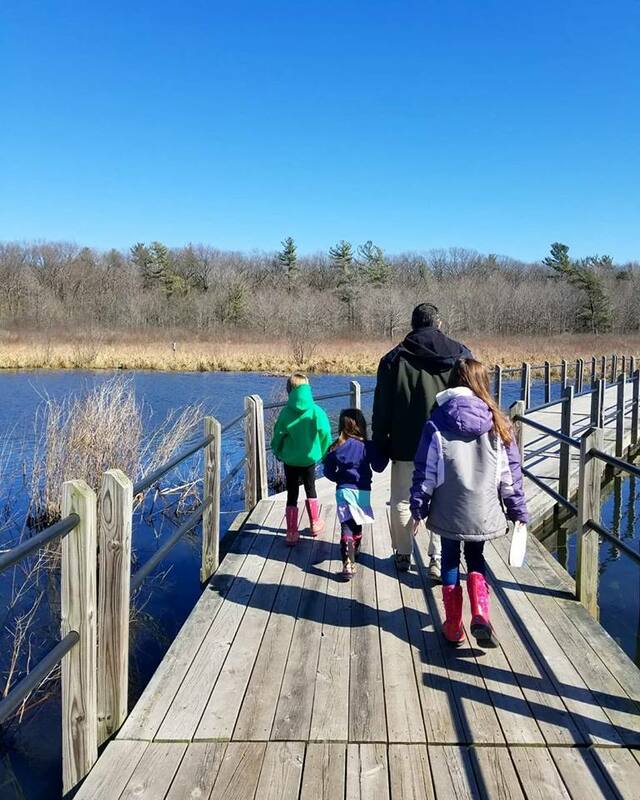 I hope you are seeing signs of spring where you live too. 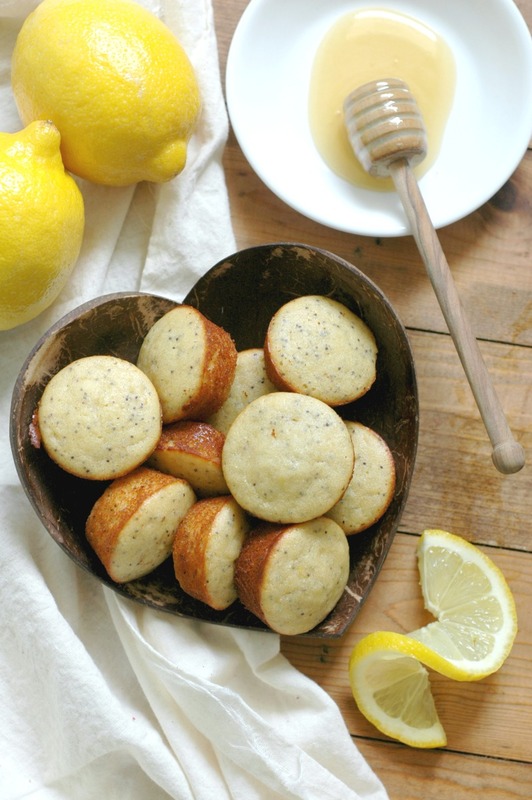 Lemon poppy seed muffins are about as spring as it gets! 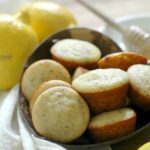 I remember the little lemon muffins piled up across brunch buffets for Easter years back, and was always drawn to the bright, fun flavor. I don’t know why it never dawned on me to try to make them myself, but I have been having so much fun testing the idea of these little mini bites in a healthier way, and my girls have fallen in love with the idea as well. Let’s face it…sometimes gluten/grain free baked goods just aren’t the same. 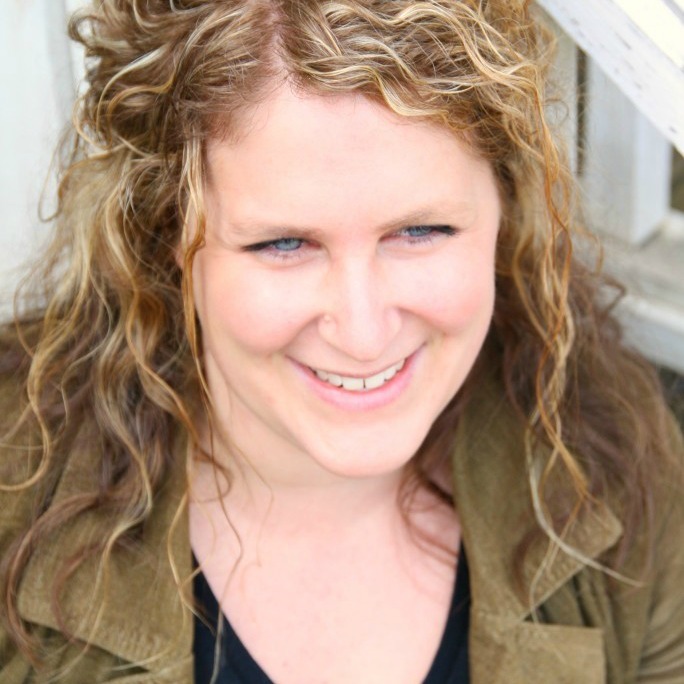 They can turn out dry and crumbly – we have all been there. After over a decade of baking gluten free with years scattered in there that had to be grain free, I will be the first one to admit it takes some practice. 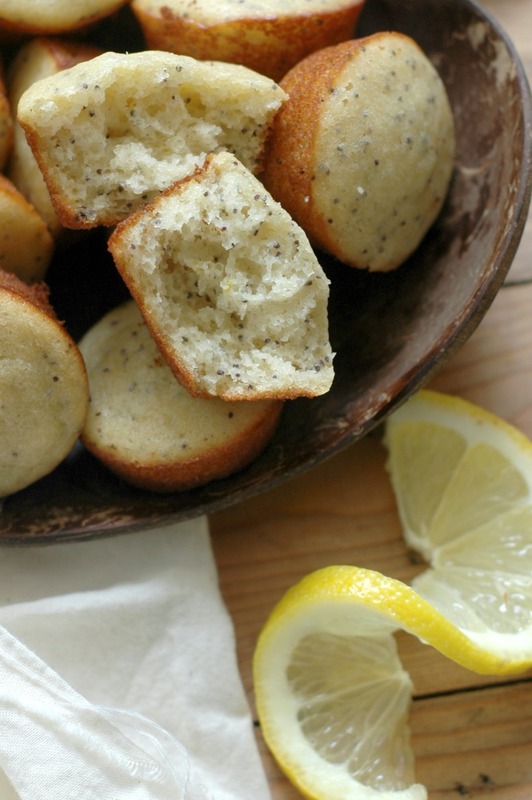 You will love how soft and fluffy these lemon poppy seed muffins feel though! 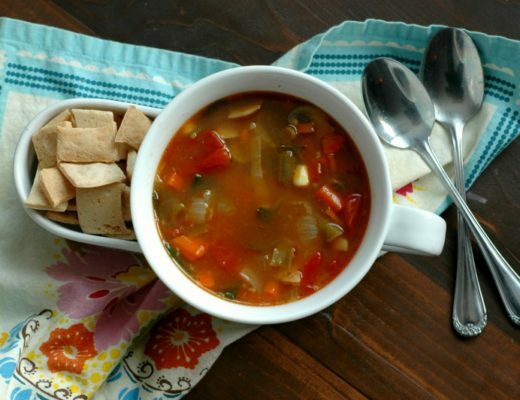 I am always blown away when I work with cassava flour – when you do it right it really has a great, soft, gluten-like texture. And of course you can’t go wrong with lemon and honey for the flavor! I think my favorite part is the hint of almond extract that really takes it over the top. Quick and easy batter *and* freeze-able…yes please! 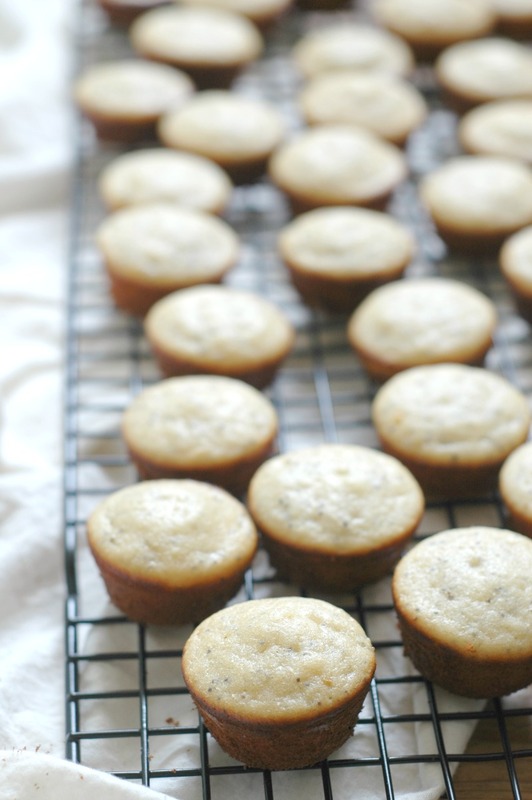 Because these mini lemon muffins are not only perfect for the Easter brunch! They pack perfectly for your hiking adventures, and be a great addition to your weekly school morning breakfast rotation too. 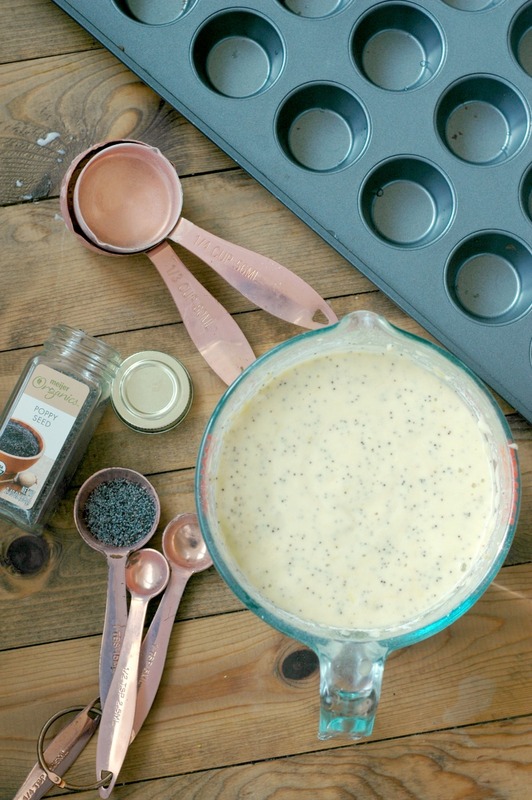 The batter blends right up into a 4-cup measuring cup to pour right into your muffin pan, and can be blended up ready to go in less than 10 minutes! I did my freezer test on the muffins last week, and the texture holds up as well as taste. Bulk up and make your mornings easier! Lemon muffins and glass of raw milk/coconut milk (You can pack the milk in a thermos if on the go. I used these for travel drinking for my little ones). You can spread butter on the muffins too. Lemon muffins spread with coconut butter, and dish of coconut yogurt. You can add collagen to the yogurt for extra protein too. If doing this to-go, just put the yogurt in a to-go container. 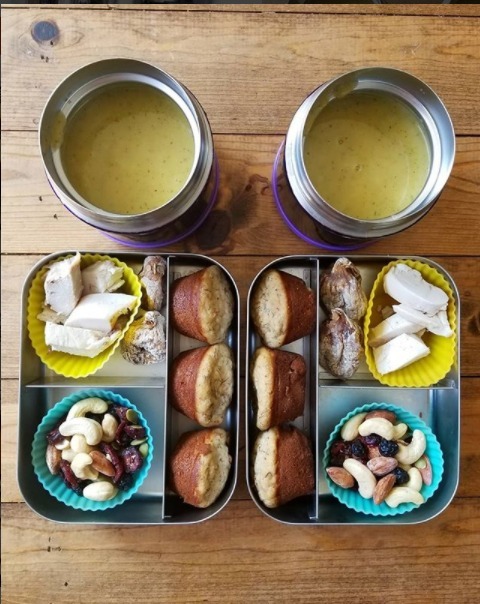 Lemon muffins, raw cheese/goat cheese, and grassfed beef jerky make a great on the go bowl of little bites! Lemon muffins, cubes of avocado, a few almonds, and a clementine make a great on the go bowl of little bites too! 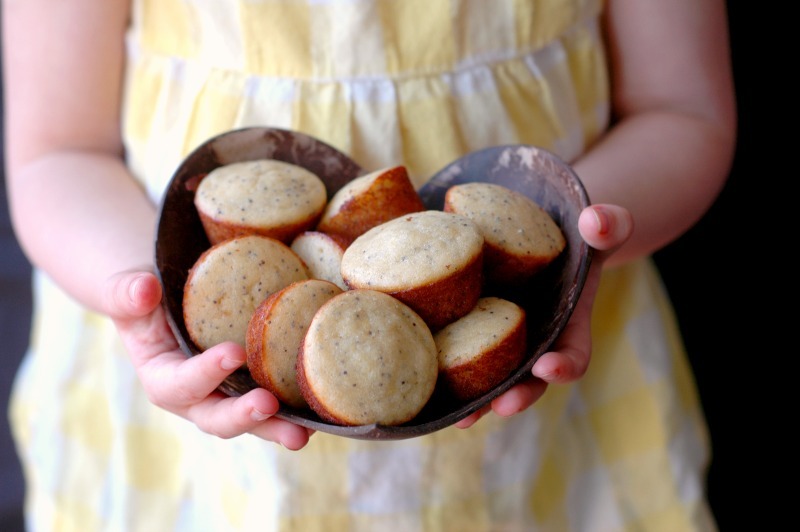 The girls have loved having the lemon poppy seed muffins in their lunchboxes to go with a thermos of soup, or in their morning snack container for mid-morning. It is a great boost of energy that isn’t full of sugar and has blood sugar stabilizing protein, fat, and fiber in a balanced combination. Make sure to measure out the lemon juice – my lemons may be more, or less juicy than yours, and the liquid makes a difference in the final product. You can swap the sweetener for your choice. We get a local raw honey from a farmer we love and the taste is so amazing. Just be sure to pick a honey that you love the taste of. If you get a very flowery honey, your muffins will take that taste on (which might be a good thing if you like that!). If you don’t have access to a quality raw honey, this is a good brand. I think coconut sugar or pure maple syrup would swap well too – the honey goes with the lemons so well though. You can swap the coconut milk for raw milk/cream if you tolerate dairy. I don’t think rice milk will be fatty enough. Cashew or almond milk/cream should be fine. I do not recommend consuming soy milk. I have not tried other swaps for the cassava flour. Even if you are not grain/gluten free, I would recommend giving your guts a break from the typical flours you use and try something new! Cassava flour is made from the cassava plant which is a root vegetable. It has numerous health benefits from gut flora feeding PRE-biotic fiber and healthy, energy giving carbohydrates. Egg free friends, I think you could make a few flax eggs to swap here. I would add a splash of ACV to help react with the baking soda to help with some rise – the muffins might not puff up as much as these since eggs really help with rising, but I know they will bind well and should taste great. I have made these with duck eggs if you happen to tolerate those better (my daughter and I tolerate duck eggs better than chicken eggs). If you try an egg free alternative, please let us know how it turns out in the comments so that other egg free readers might gain from your experience. Thank you! I think you could leave out the collagen if you don’t have access to that. I love the extra bit of protein and gut nourishment it provides, and collagen tends to lend some softness to baked goods that I love. Little hands friendly, and toddler approved! I’ve been a bit laid up over the last 6 weeks healing a broken wrist (boo! ), and I’m telling you, dear momma, I am so thankful for this mini muffin pan that I just happened to get not to long before that. I have been able to have a freezer bag filled with quick, healthy muffins for my littlest to munch on for early school mornings, and I can back off on too much breakfast cooking. Toss a few mini muffins in a little bowl with a hardboiled egg, and your little guy can have a nutritious breakfast on the way to dropping siblings off to school, or packed up in a container to have for breakfast at daycare. ¼ cup raw honey This is mildly sweet - you can taste the batter and add more to taste if you like. I get raw honey from a local farmer. If you don't have access, THIS is a good brand. 1 heaping tbsp lemon zest this has been the zest of 1 lemon for me. Pre-heat the oven to 375 degrees and grease your mini muffin pan. I like to use this avocado oil spray for ease, but you could dip a paper towel in some avo oil to wipe the pan. Blend the eggs, honey, oil, lemon juice, and almond extract for 1 minute on high. I have been making my batter right in my 4-cup liquid measuring cup to make for easy pouring right into the muffin pan – it fits perfectly. A small mixing bowl works too. Add the coconut milk, cassava flour, collagen, baking soda, salt, lemon zest, and poppy seeds, and blend on low until combined. Pour the batter into the greased muffin pan and bake at 375 for 11 minutes. Let the muffins cool in the pan for a few minutes before turning out onto a cooling rack to cool the rest of the way. To freeze the muffins, let them cool completely before putting into freezer safe bags. These look heavenly! I need to start baking! Yep, yep, yep! I am in love with lemon poppyseed anything and especially when it’s in a convenient package like this! I always need new, easy breakfast ideas, and this one is great! I can’t wait to make these!!! 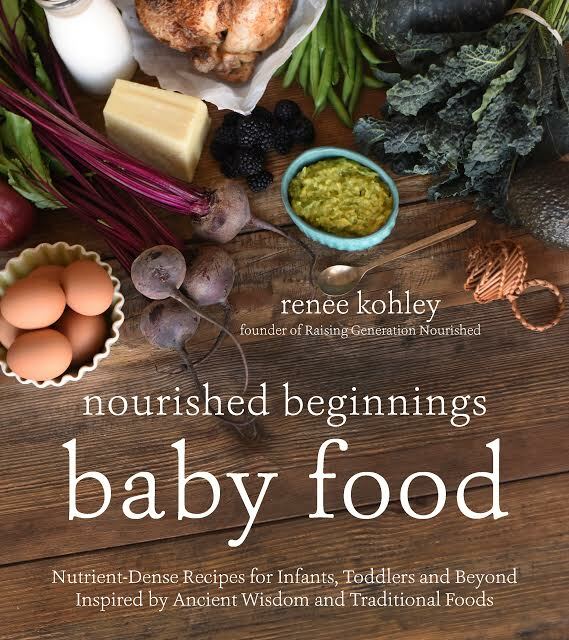 I love that you used cassava flour and all that collagen. LOVE the lemon flavor too! So perfect for spring. Such sweet photos Renee, love seeing those little hands. These are so perfect for spring! I’m in love any lemon flavored baked goods, so I’m sure I’ll love these. I passionately love lemon cake and lemon muffins. These look so good! I am seriously drooling….these look AMAZING!! You have all sorts of lemon goodness coming our way lately! I was just working on a list of snacks to make for my husband while I’m out of town. Definitely making these for him (and maybe taking a couple for my travel). Such fun little bites — healthy cake, mmm! I really like your suggestion to serve these with goat cheese and beef jerky. That’s just how we do lunches around here, and I usually throw a little lettuce their way, too, because I got 2 boys who like greens! 😉 Thanks, Renee, for another fun baked good recipe! How adorable are these!! I bet they’re perfectly sweet and totally addictive too! These muffins would be such a nice addition to my Easter brunch menu. I think my boys would gobble these down in a second. These are so cute! I haven’t had poppy seed anything since I was a kid- so excited! These are so cute and I love how healthy they are! I know me and my toddler would love them! These muffins look so pretty and perfectly formed (haha, is that a weird thing to say?)! I love lemon in baking, it’s such a wonderful flavour! Totally going to make a batch of these over Easter and put them in the freezer – so handy for packed lunches or snacks. Great recipe! Loooove it! Sounds amazing – can’t wait to try! These muffins look so light and fluffy! Perfect for a grab n go breakfast! Muffins look so cute and spongy! Perfect for little hands and for parents too. These are just absolute perfection. I love lemon muffins. And I love that they are made with cassava flour. I’ve baking with it more and more. These are so cute, and the texture looks perfect! I really wanted to love these, but they came out super dense and gummy and not at all like the texture pictured =( The only sub I made was using half & half instead of coconut milk. Any suggestions?? Hi Michelle! I am not sure if the half and half is the difference but it really could be since it is a totally different make up than coconut milk. I make these every couple weeks and they turn out perfect each time! I’m sorry they didn’t work out for you! 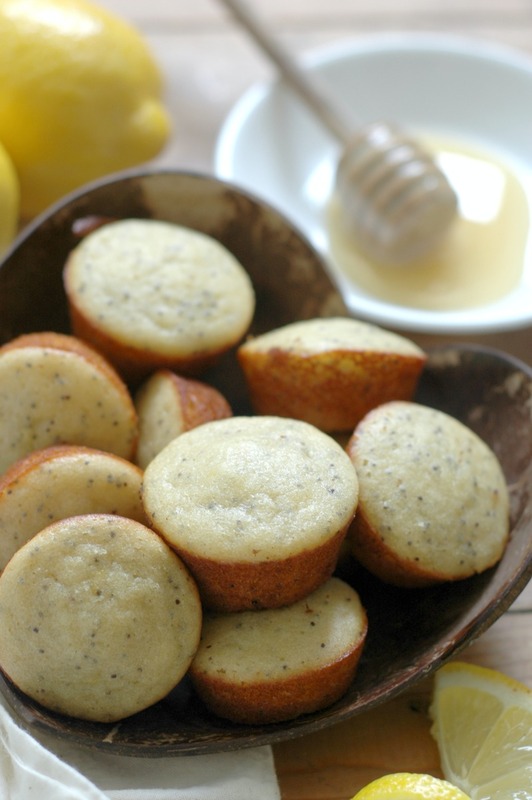 These look so good, I love lemon poppyseed muffins, but it’s been forever since I had one! So thanks for a great recipe! I’m so glad you enjoyed them Nicole! Thanks for coming back to let us know! Has anyone tried these using standard muffin tins? What would be the change in baking temp/time? Hi Ann! I have done this once or twice and you just cook maybe 10 minutes longer. Is there a substitute for collagen? I don’t have that on hand. Thank you!